Happy Friday, y’all! For our 3rd and final guest poster (for now, at least) we’ve got the sweet Sarah from Printable Charm sharing with us a super delish recipe….and a Free Menu Planner Printable! So heeeeeeere’s Sarah! Woot Woot! At my house that question is met with hands raised and excited expressions! My boys (including my husband) love breakfast for supper. Now that school is just around the corner, I am gearing up with menus in hand. I love to plan my menus ahead of time. It makes the whole, “What’s for supper, Mom?” moment at the end of the day so much more pleasant! I’m even sharing one of my menu printables with you! I hope it helps you as much as it helps me. I was thrilled when Danielle asked if I would share a favorite family meal with you, and looking at all the yummy recipes on her site knew I would have to bring my A game. So, these aren’t just any biscuits. These are my mom’s cheese biscuits. It wouldn’t matter if Mom and I used the same recipe, same cooking utensils and same baking dishes…hers will always taste better. Is it a secret potion moms know how to sneak in whatever it is they are serving up? I hope at some point that transformation occurs for me. You know how boys love their mothers’ home-cooked meals! My mom cooked breakfast and supper every day for our family. Even when we were all busy with work, piano lessons, dance class, church, cheerleader practice, softball and basketball, she made sure we ate those two meals together as a family sitting at our round wooden table.I don’t remember when Mom first began the tradition of cheese biscuits on Saturdays. My sister was a cheese-aholic. She primarily dined on a diet of cheddar cheese, baked potatoes, chicken breasts sauteed in soy sauce, and hamburger patties for several years during childhood. She has since branched out, but Mom might have added cheese to her biscuits to coax Katie into trying anything new. When all the cousins would travel to the beach for our annual vacation, Mom and Aunt Zanne would take turns cooking breakfast with Aunt Gee for all the kids. Mom always packed her box of Pioneer biscuit mix just in case the IGA did not think as highly of the staple as we did. The biscuits have garnered a following over the years. Light and fluffy inside with a little crunch on the outside…best enjoyed right from the oven. 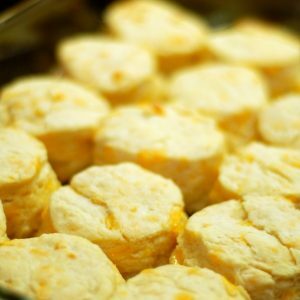 The shredded cheddar makes little pockets of oozing cheese inside the biscuits. Donnie, Jack and Brett eat theirs with fruit preserves, but I like mine plain. Stir together biscuit mix and milk until combined. Gently mix in cheese. Sprinkle counter with 1/4 cup baking mix. Turn dough onto floured surface. Knead a few times. 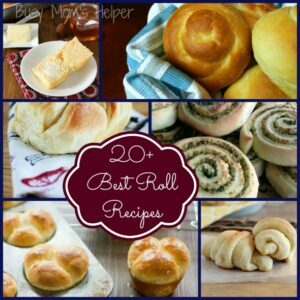 Roll 1/2-inch thick. 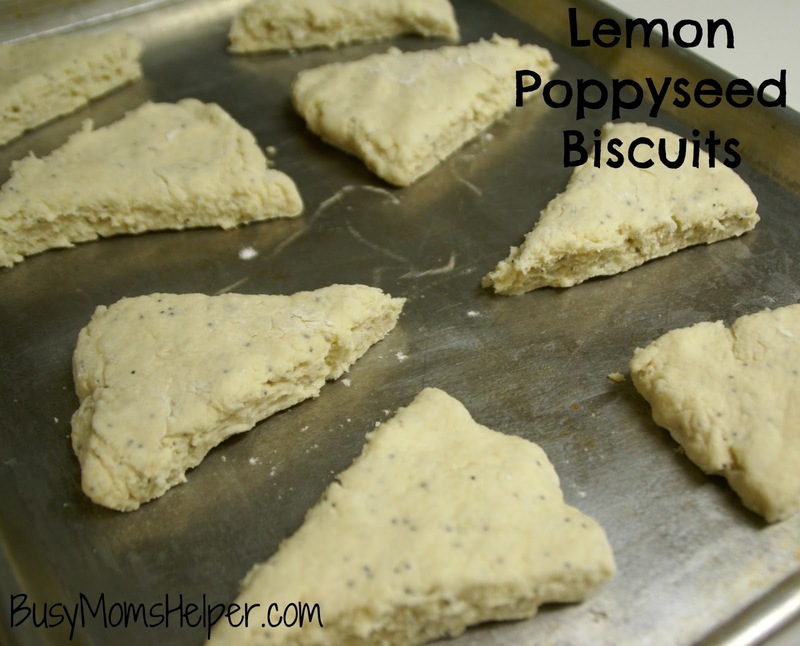 Cut biscuits with a 2-inch cutter. Pour 2 T vegetable oil in 9 x 13 baking dish. Place biscuits in dish, turning each biscuit over once coating both sides with vegetable oil in baking dish. (This is her secret for perfectly crisp outside and fluffy inside!) Bake at 450 degrees for 12 to 15 minutes. Click the link below, enter your email address, and I will send your Free Menu Planner! I would love to keep in touch. You can find me on Instagram, Pinterest, Facebook and Twitter. Click here to receive your free printable menu planner. Don’t you just love it when you make a new thing, and everyone is happy with it? It doesn’t happen often that 6 out of 6 in our household all agree about a meal, but occasionally I hit it right on the mark. This is one of those! I was so glad when every single person was asking for more, especially since breakfast is such an important meal. 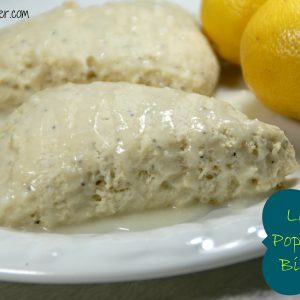 These were so easy to make, too – double bonus!!! Preheat oven to 400 Degrees. Spray a baking sheet, or line with parchment paper/Silpat. 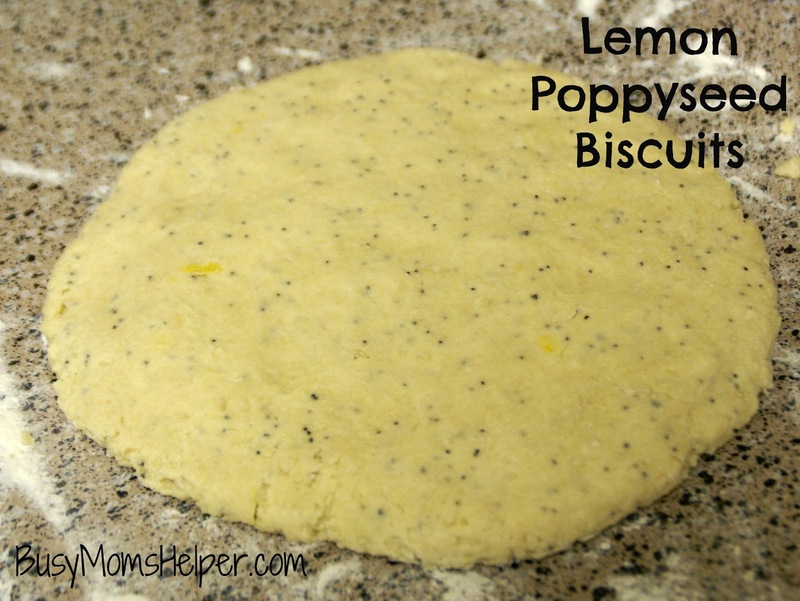 In a medium bowl, mix the Flour, Sugar, Baking Powder, Baking Soda, Salt, Poppy Seeds, Butter and Lemon Zest. Use a fork to combine. In a small bowl, whisk the Sour Cream and Egg. Combine with the flour mixture until everything is moistened. On a lightly floured surface, roll the dough into a ball, then press into an 8′ disk. Cut into 8 equal wedge pieces. Place the pieces evenly spaced on the baking sheet. Bake for about 14 minutes, or until lightly golden. Remove and let cool. Mix the three ingredients together in a bowl. Drizzle over the cooled biscuits. I know I’m new to the wonderful Texas weather, but it does make me feel at home the way it keeps switching (I’m from northern Utah, and there it could go sunny t-shirt to snowing within 24 hours). Two days ago we were in 80 degree weather here, yesterday it was raining and we needed sweatshirts to go to the bus stop to pick up Failyn. At least that way we’re not doing much of heating or a/c, so saves on the bills! 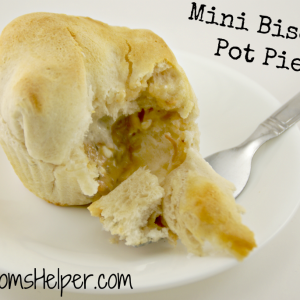 These Mini Biscuit Pot Pies (aka: The Pot Pie Quickie) were just perfect for the cooler, rainy evening! Easy to make (I feel extra lazy when it’s like that outside, just want to curl up with my kiddos in some warm blankets), delicious and warm. I love how the crust is nice and flaky, and the filling so moist and perfect. You wouldn’t think they’d be so easy to make, but they definitely are! This is the only thing I’ve made this way so far, but many more filling varieties are to come, that’s for sure. 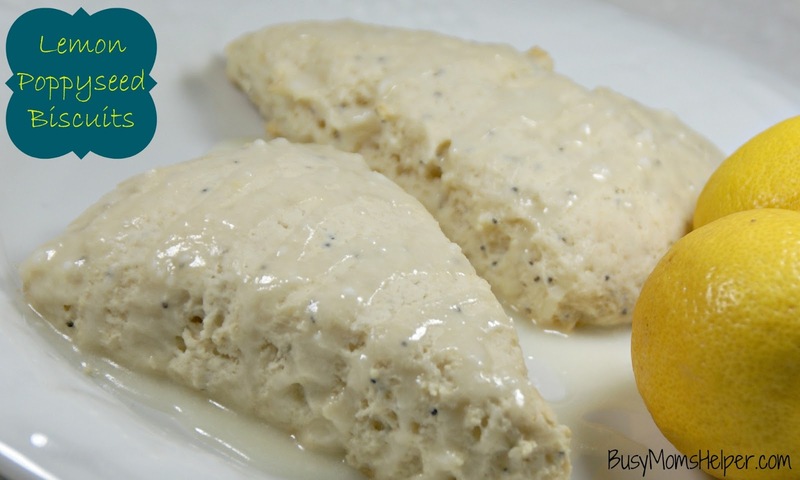 In a medium sauce pan, mix the milk, flour and pepper. Stir in the soup and cook over medium heat until thick and bubble, stirring often to prevent burning. Add chicken and cream cheese. Heat through until cream cheese is melted. Open the can of biscuits and separate them. Take each one and stretch it so it’s larger and more thin. Think of a pie crust. 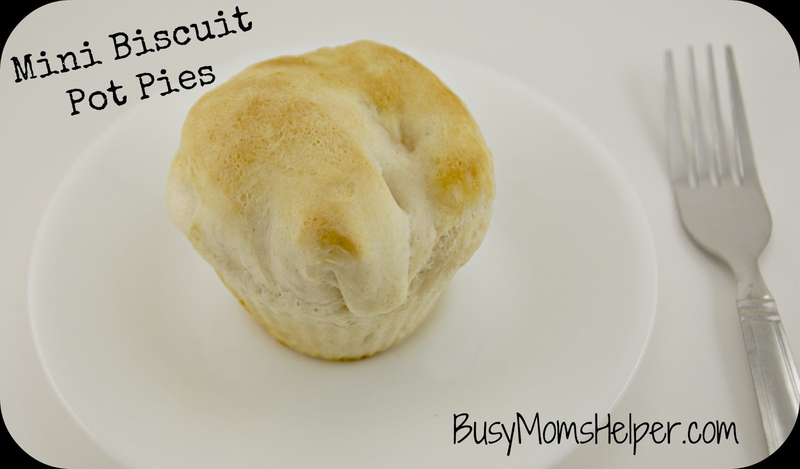 In a sprayed muffin tin, line each cup with a stretched biscuit so it covers the entire inside of the cup, plus hangs over the sides. Divide the soup mixture between the cups, filling them almost to the top. Fold the overhang of biscuit over the top, pinching as necessary to enclose the soup filling. Bake for about 10-15 minutes, or until pies are golden brown.